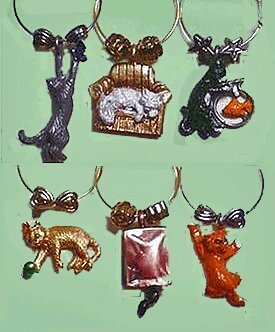 It's All About Cats with these cute wine charms. Simply attach these collectible wine charms on to your stemware so each guest can find their wine easily (not yours by mistake!) and raise a glass to good times and good friends assured of which glass is yours. Set of 6 wine charms, comes in gift box. Be sure to see our other wine charm designs as well.